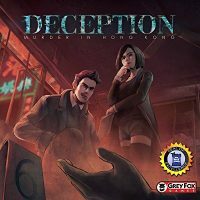 Deception: Murder in Hong Kong is a re-implementation of CS-Files by Jolly Thinkers. We are very excited to announce the game has received the Dice Tower Seal of Excellence and Grey Fox Games is proud to be bringing this great game to a wider audience. Add a Review for "Deception: Murder in Hong Kong"